The Gem Rocks slot by Yggdrasil Gaming takes place on a mountain. But this isn’t just a regular mountain, because it seems to be full of valuable stones! And of course, it is your job as a player to find them, because if you manage to collect enough of the same types of rock then you will qualify for a wonderful prize! The gems that you will find during your playing session are green and round, yellow and moon-shaped, blue and diamond-shaped, grey and triangular, purple and diamond-shaped, green and square, and orange in the shape of a cross. In addition to that, there is also a glowing golden star on a red background, which is of course much more valuable than the rest. All of these different rocks can be found on the game screen of the Gem Rocks videoslot. Since this screen has a setup of four by six squares, they will come down with twenty-four at a time, after which you can make winning combinations from the left to the right. This can be done in any way, meaning it is actually quite simple to calculate how many different pay lines there are. That would come down to 4x4x4x4x4x4 = 4096 pay lines and that means you will get more than enough chances to grab a random prize while paying this casino game. Once you manage to get one or several winning combinations in the Gem Rocks slot by Yggdrasil then the bonus feature with the falling symbols will activated automatically. This will make all of the symbols that are involved in winning combinations explode, after which they will simply disappear from your screen. This will of course lead to empty spaces being left in your screen and those will be filled with new symbols that fall out of the sky. Those will let you make new winning combinations without having to place another bet with your own money, which may repeat itself time after time. As you may have noticed, this feature works exactly the same as in the Double Dragons slot and the Incinerator slot which are made by the same developer, which means it isn’t necessarily a new thing. But hold on, because this special feature can also lead to other bonus features which may provide you with even more winnings! So, with those falling symbols you may get the one free re-spin after the other, which will let the total prize gradually get bigger and bigger. That is of course already very advantageous for the player, but this isn’t the only way in which the bonus feature with the falling symbols can work in your favour. 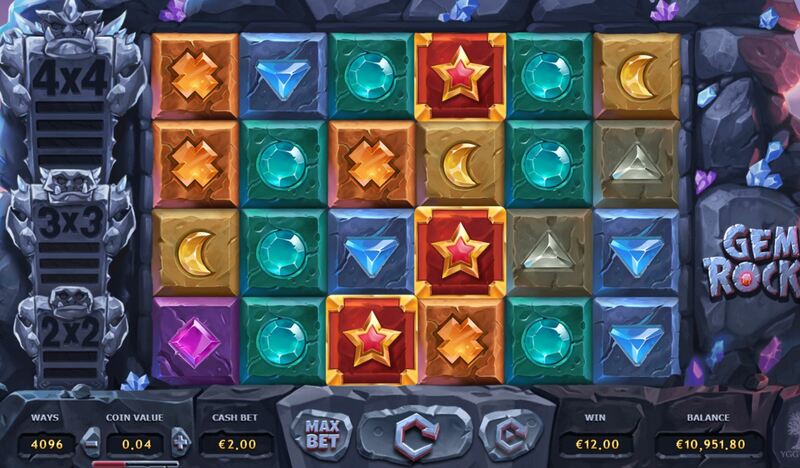 If you look closely, you will see that there is also a meter shown on the left side of the screen of the Gem Rocks slot. This meter starts with two stripes which lead to a small monster with the characters 2×2, followed by three stripes which will lead to a bigger monster with the characters 3×3, and finally four stripes which will lead to the biggest monster with the characters 4×4. So, what does that mean exactly? When you start playing this videoslot then you will find that the lowest line will light up at the exact moment you make your first winning combination. Did you get a free re-spin, which lead to one or more additional winning combinations? Then the second line will also light up! This will keep repeating itself until the entire meter has been filled and that will also activate the most interesting bonus feature that you can run into while playing this videoslot. There are nine lines, but those aren´t the only things that are shown on the bonus meter. Because, as I had mentioned before, there are also three different kinds of monsters which get bigger on every level! The first one will wake up once you manage to fill to lines and he will then suddenly jump into your game screen. As the signs on the meter show, he is exactly two by two squares large and he will take the colour of one of the available types of gems. He will then find a place on the reels and that will pretty much guarantee several winning combinations. Did you manage to wake the second monster? Then the same principle applies, except this time you will get a ‘monster rock’ which is 3 by 3 symbols in size. The last and the biggest monster will of course also do the same thing, except he is pretty much sure to provide you with a mega big win. This monster is 4 by 4 symbols in size, meaning he will allow for lots of different winning combinations. And that easily explains how it is possible to win up to nine thousand times your bet as a result of a single spin on this game!